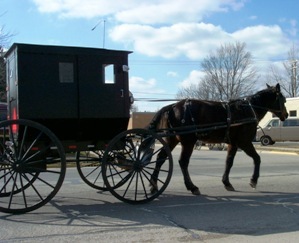 Amish have lived in Illinois since the early 1830s. The Arthur community, with a population of around 4,000 Amish, dwarfs all other settlements in the state, most of which measure at most a few hundred souls. The Arthur Amish settlement holds a special place for me, as it was the first community where I met Amish on a wide scale. I sold a set of Bible-oriented books, the Family Bible Library, in this settlement in 2004. I found them to be quite popular among Amish in this community, but less so in another Illinois Amish community which I also visited that year. At one time, one of the largest Amish communities in North America–larger at the time than Lancaster County–was found near Peoria. No Amish remain there today. Over the past two decades, Illinois has had one of the fastest-growing Amish populations of any state. Amish at Arthur make frequent use of bicycles, which are well-suited to the area’s paved roads, and often tow their children or groceries in attached “bike-trailers”. Arthur is a highly entrepreneurial community, with many woodworkers among other Amish businesses (read more: Amish Furniture-Illinois). Learn more about Illinois Amish in today’s new Amish State Guide entry. 😀 a really really big smile and a few giggles(yes, even old ladies still giggle!) Thank you sooo much!! I need to get on to read the rest now.. a liitle late checking the email this a.m. Also, I am curious, Alice, about the stories! I live down near Effingham (southwest of there actually) but worked in the Douglas/Moultrie county area for a while and really enjoy being up there. I am currently getting to know wome wonderful people near the St Peter area who are Old Order Mennonite (horse and buggy type)who mostly come from the Ohio area, it sounds like, and settled the area about 1-15 years ago. It is a small but growing community and the people are so very nice. Erik, feel free to pass along my email to Alice if that is proper. Or, Alice… fill us in on the stories! thanks again Erik!!! I have been trying to find more info on the Mennonite shops that are in and around St. Peter IL. If you should get this, is there anyway I can find out more info about them? The tourist center is closed until Memorial day and I can’t find anything online. I’ve been to Zimmerman’s Greenhouse and the little General Store on 900N but didn’t know which direction to go to search more shops. I heard they have around 15 shops out there. Can you help? I would greatly appreciate it! Sorry to say I haven’t been there since last year. Other than Zimmermann’s and the General Store (where they have the pretzels), I went to a fabric store with a lady there thatwasdoing some sewing for me. However, they were getting ready to move somewhere across the settlement and I have no idea where. The lady that did the sewing for me – her family also had a produce stand… and around the corner east of her place and back south was a cabinet shop. I can get there but have no idea the roads – it is near Gatch Lake; and it is just east (and the cabinet shop then south) of the church and school… other than that I am pretty clueless though there a quite a few signs around. The country store near St. Peter might have a map of the other Mennonite businesses, which include produce stands, craft stores that carry quilting supplies and straw hats, a produce auction that supplies grocery stores in STL and a bakery, along with a feed and tack store, greenhouse, and dairy. The map is pretty detailed. Or anyone can give you directions, pretty friendly people. Thanks Alice and Amy Jo! Amy Jo I just answered the questions you had on the bookshop in the comments for the actual Illinois Amish entry. katie – that is exciting! I have called Cadwell “Graberville” to myself for a number of years because of all the Grabers living there and near – it is a nice little settlement. And, of course the pumpkin patch and havest bakery nearby – yum! now, I really nead to get back to the gutters… just came in to get my safety glasses and couldn’t resist another peek here… I tried the link to your blog today from here but didn’t work like before… but, I think I have it saved just the same… but, to work or I will regret it… blog reading later… I appreciate your posts btw. I wonder what the new stories are? One of my sisters met her man in Pinecraft Florida like 36 years ago, married him and lives in Caldwell IL ever since. I love Arthur. My first knowledge of the Amish was born here. I was born, raised ans spent 33 years in Atlanta, Ga. I now reside in Atlanta, Il where traveling to Arthur is something I look forward to several times a year. We have visited many Amish communities in several states and we always go back to Arthur at least twice a yr. There seems to be a peacefulness there we can’t ‘feel’ in the other communities. We obtained a buggy from Arthur and use it as seasonal decoration. It was past the Amish use but works great for our need. Price was right, too. The Tri-County Auction is held the 4th Sat of March and Sept and we LOVE going to it. It is held on a Yoder’s farm. Hundreds of Amish and Mennonite attend. If you really want to mingle with them, this is the place. I’ll let you know about the stores next week after I go down and see if I can find them. They are suppose to be supply stores along the lines of Beachy’s. One is suppose to be on North Vine St. Almost to Rt. 36 near Atwood. The other is suppose to be south of the 4 way stop at Rt. 133 and Vine St. then make a right at the next 4 way stop and down that road somewhere. I have some friends that live in Atwood that told me about them. Not sure how long they have been there, so maybe they are just knew to me, LOL. My goodness Alice, I read ‘stories’ instead of stores I guess… the family health food store is just south of the 133/vine st intersection – not a new store but new building ( within th last yr or two) and the other I am not sure. ‘course, could be newer as it has been a bit since i really explored the area… thanks for the info! Hi Amy Jo,,, the friend of mine told me it was new. Perhaps, she did not know it located there from another spot. Either way, it will be new to me, LOL. I saw you had typed “stories” and I thought perhaps it was a typo, LOL. I’m hoping I will have a day next week when I can go down and just explore for a while. Lately when I have gone it has been just a fast dash down and back as I am up in Clinton. Thanks! I live southwest of Effingham but, I agree about going there – sometimes I just like to go to the area to ‘get settled’. just a peaceful, ‘I’m at home now’ feeling… when I served that area, I spent a time meeting with poeple in the library (as well as the high school). Alice and (ugh, I just forgot her name) there are very helpful and friendly… ok, gotta get outta here right now – hubby is waiting for us to leave for Sunday eve meeting… keep me posted! Amy Jo, you have my curiosity going, what do you mean “when I served that area”? What kind of serving, what did/do you do? I would love to make friends with some of the folks down there. I guess I have been a little shy about it because I do not want to offend anyone. Alice, I am used to saying served when I should probably say worked. I worked in Douglas and Shelby counties (and a little in moultrie) at the time and now I primarily work in Edgar and shelby and am phasing out of moultrie. I just tend to say serve rather than work; like, I serve my customers rather than work with clients. to exchange email, one email I could use is GmaA2000@live.com (stand for gramma A or Grandma Amy which I became in 2000 – now have 17 grandchildren :-O wow was that fast!) I don’t think anyone there would be offended btw; and, I would like to become more acquainted with the local Amish there perhaps.